What is the best Thanksgiving side dish to serve with your Thanksgiving turkey? Here’s your list of 21 easy side dish recipes that are about to become your new classics. Thanksgiving is all about gratitude and tradition, and when it comes to the Thanksgiving table, everyone has their favorite traditional dishes to share. Ironically, the side dish is one area of turkey day where you can tweak tradition with simple twist or two. Whether you’re hunkering down at home, or getting ready to brave the busiest travel time of the year, this list of Thanksgiving favorites are sure to set the mood for a festive feast. From fresh takes on classic comfort sides to flavorful new additions, take a look and add a classic to your table. Dig in! This is THE quintessential Thanksgiving side dish, but I’ve given it a healthified makeover by swapping out canned veggies for fresh, lightening up a homemade creamy sauce, and topping with baked onion rings for classic crunch. Gratins are a way of Thanksgiving life, and this cheesy roasted squash recipe is one that jump starts the dinner, but surprisingly its on the healthier side. Get a head start on this recipe with my Instant Pot Butternut Squash. This amazingly easy, 5-ingredient recipe makes traditionally bitter brussels sprouts sweet and crazy delicious thanks to roasting in a cast-iron skillet to create a caramelized bite of baby cabbage and salty pancetta for one of our very favorite Turkey day side dishes. Who says sweet potatoes have to be mashed and topped with marshmallow to have a seat at the Thanksgiving table? Not I! These wedge-style potatoes are seasoned with chili powder, cinnamon, thyme, and a swirl of maple syrup, then oven-roasted to caramelized perfection. So totally seasonal appropriate, these sliced squashes with a nutty topping announce the holiday’s have arrived. Whichever side of the table my husband’s sitting on, as along as this 5 Ingredient Slow Cooker Creamed Corn is on it, he’s going to be one happy harvest feaster. Another classic side dish with a sweet inside that’s somehow made even better with a sweet marshmallow topper. A brown butter base creates this creamy pumpkin topper that’s made even better with a dose of mozzarella for the ultimate veggie melt. This simple stuffing hits the holiday high notes with seasonal cranberries, walnuts and fresh herbs in a traditional bread-based casserole. This oh-so-simple, yet delicious side is a blessing when your oven is close to bursting with more time-consuming dishes that take hours to prepare. Roasted broccoli comes together with just a handful of ingredients and 15 minutes. This classic fruit salad is one of my favorite family holiday recipes because nobody can pass up its tropical fruit and marshmallows bathed in tangy whipped sour cream. Give your guests something to talk about (anything but politics, please!) with these tangy taters. Smooth potatoes are whipped with rich buttermilk and bold blue cheese for a quick and tasty side all parties can agree on. I had never hear of corn pudding until a few years ago when we did friendsgiving with a neighbor who grew up in Texas. This recipe ups the ante with crispy jalapenos–a crunchy contrast to the sweet corn souffle. East meets west (did you know butternut squash originated in Mexico and Central America?) 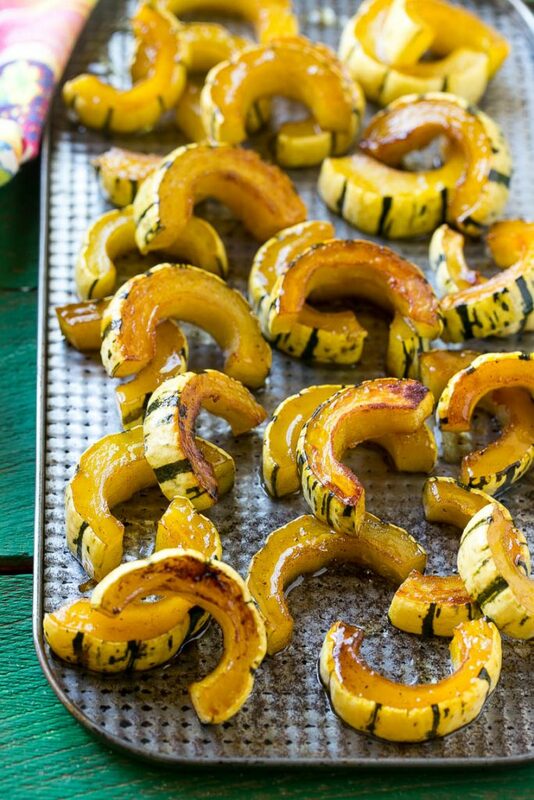 in the best way with this unique side featuring season squash in a tempting miso-molasses marinade. If you have leftovers from this recipe, try dicing up the squash to to my Kale Salad with Butternut Squash, Chickpeas and Tahini Dressing. I’ve been obsessed with delicata squash since discovering it in the grocery store a couple of years ago. This savory stuffing uses healthier chicken sausage and pecans as a balance to tender squash and soft bread. I’m not saying it’s right to lie to people…but it IS wickedly fun to watch someone’s reaction when they learn this smooth and fluffy cauliflower dish isn’t prepared with potatoes. This is tasty way to trim off a few of those holiday calories, and sneak in a few healthy veggies along the way. So much goodness that this stuffing doesn’t even need a turkey. Loads of fresh herbs make this side dish a happy one to stuff yourself with. If you scream at the idea of creamed greens (try saying that five times fast! ), don’t run the other direction before you try these. Healthy swiss chard puts a modern spin on this comfort-food dish, with a light but creamy sauce, and topped with crispy garlic panko breadcrumbs. This Cauliflower Casserole with bacon is not only worthy of Thanksgiving, but it’s also a side dish to put in the archives for future dinner parties and date nights. This green bean recipe was from the first real Thanksgiving I cooked on my own. The crisp beans add a fresh bite leave enough room for seconds. Looking for more ways to make your Turkey Day extra special this year? What are you looking forward to making this year–are you trying something new, or sticking with your favorites? Thanks for the shout-out! This is really making me hungry for Thanksgiving side dishes! So many great options here! I can’t wait! Thanks Kalyn! I’ve been on the lookout for a creamed corn recipe and I love that the one you included can be made in the slow cooker. I seriously want so many of these sides, they all look and sound delicious! So glad Kim! Let me know how you like the creamed corn! Making us hungry over here!!! Thanks for some great sounding recipes, Heidi! I routinely use your green bean & shiitake recipe, as well as the roasted Brussels sprouts recipe. A few others that I’ll try – the broccoli and cauliflower dishes. I do a very similar recipe with the delicata squash recipe you’ve included – the only real difference is in the spicing – try using nutmeg and/or allspice in place of or in addition to the cinnamon. REAL maple syrup is a must, not the maple flavoured stuff. Vermont or Quebec maple syrup are the best!! I’m excited to try some of these ideas :) I love food and I love to try new recipes. Lately I did a Naples food tour and discovered new tastes. It is the most beautiful thing :D So I thank you for the sharing. Elisa, that sounds so incredible! Thank you for sharing! There are so many yummy options! Thank you Sabrina! I hope you have a wonderful Thanksgiving. Thanks for sharing this awesome recipe . This text will not be about these varieties. It’s in regards to the picket masterpieces that stand the take a look at of time.